1. A son of Issachar who had journeyed to Egypt with Jacob (Gen. xlvi. 13). 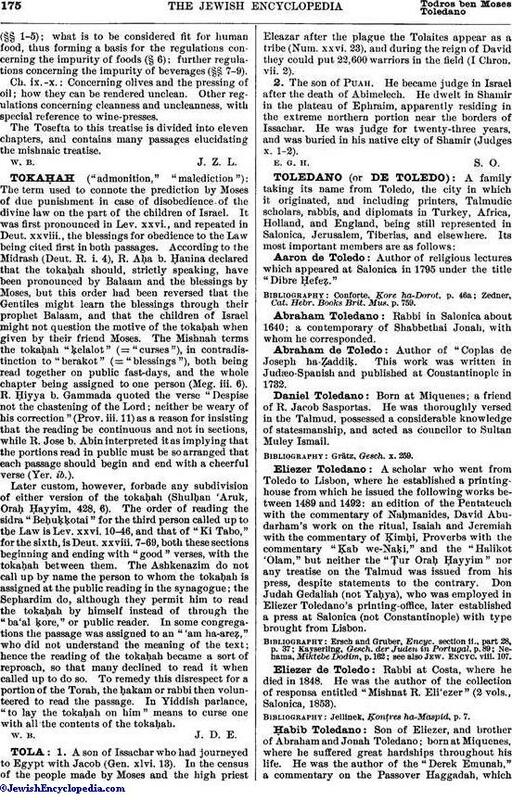 In the census of the people made by Moses and the high priest Eleazar after the plague the Tolaites appear as a tribe (Num. xxvi. 23), and during the reign of David they could put 22,600 warriors in the field (I Chron. vii. 2). 2. The son of Puah. He became judge in Israel after the death of Abimelech. He dwelt in Shamir in the plateau of Ephraim, apparently residing in the extreme northern portion near the borders of Issachar. He was judge for twenty-three years, and was buried in his native city of Shamir (Judges x. 1-2).